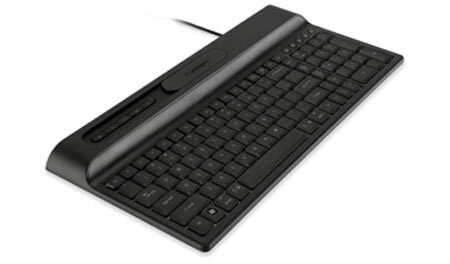 The striking feature on the Kensington Ci70 keyboard is the two full USB ports for peripherals placed on top of the keyboard. Breaking away from the norms of placing the ports on the side or the back, this new placement is a welcome change. 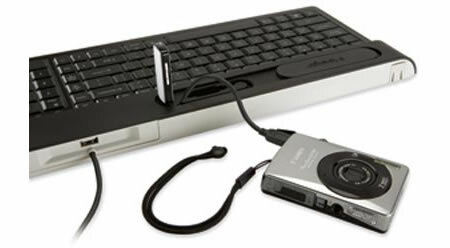 It makes it easier to load in a flash drive or some portable media players. A third mini USB port with cable also hooks up the digital cameras conveniently. The Ci70 is comparatively smaller with a third less footprint than most keyboards and notebook-like keys that provide quicker typing than full-height desktop models. Media keys at the top and side supply both shortcuts to commonly used apps as well as navigation for music and videos. Kensington Ci70 Keyboard with USB Ports has no listed launch date but this Mac- and Windows-compatible keyboard will set you back by $50.